the 26th. of january is the feast day of sainte dévote the patron saint of the principality of Monaco and of the Prince’s family. The saint, who died about 303 AD, is likewise, the patron saint of Corsica. She is one of a trilogy that emerges from that mist-covered late Roman era, the fourth - fifth century with other legendary iconic saints, part mystic and part historical figure like St. Patrick and Saint George. All three belonged to a then emerging ruling class of Christian Roman nobility against whom, with the exception of Patrick the still dominant Graeco-Roman religious establishment were fighting a loosing battle. Saint Devote of whom historical evidence for her existence does exists, was a classical victim of the counter-reaction by the non-Christian Roman establishment, especially after the Edict of Milan of the 313's when the recognised imperial religion of Rome became, under Constantine, Christianity. Similarly St. George belongs to that transitional period going from Hellenistic-based faiths to Christianity and who, in 303, suffered a similar end as a martyr. Unlike the other two saints, St. George, however, has enjoyed an enduring press for nearly two millennia. He remained a permanent figure in Western art iconography from paleo-Christian art up to Raphaels masterpiece of about 1506, St.George and the dragon. St. George went on to become the patron saint of England in the 11th.century with his distinctive banner, a red cross on a white background forming part of the flag of England. Adding to his many other trophies, he became the patron saint of the Genoa republic and of Liguria. About the same time, Christianity in Ireland got its foot in the door when the High Kings and Irish aristocracy, through the energetic proselytising of Saint Patrick and his followers, abandoned the old Druidic faith for the more fashionable influences coming from Rome. 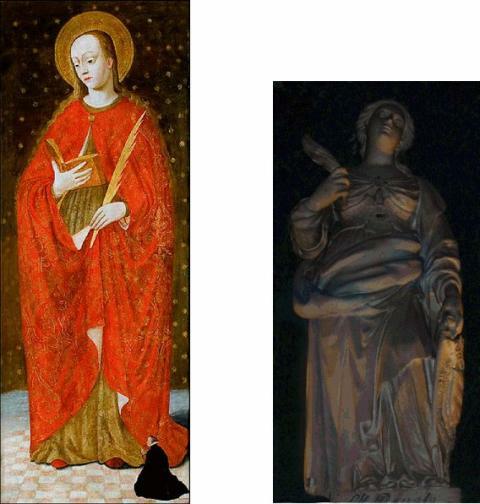 There are few surviving images of Saint Dévote in Monaco from the Renaissance period. The exceptions are the saint Dévote altarpiece and a painting of the saint dated to the eighteenth century, in the chapel of the Royal Palace. Paintings of the saint may have disappeared over time particularly during the reign of Prince Louis l when, towards the end of the 1600s, uncertain economic circumstances forced him to liquidate the important art collection built up by his grandfather Honoré II. The unstable conditions existing during the French revolution also hastened the dismemberment of a large part of the Grimaldi collection. Detail of Saint Dévote from altarpiece of that name in Saint Nicholas Cathedral Monaco. The slightly Franco-Flemish style of the work of art shows, in addition, some Catalan influences. It has also, been attributed to the Ligurian school. It may have been created by a follower Of Louis Bréa working in the Monaco region in the 1500s. Late Baroque sculpture of the saint executed in Carrara marble. The style is similar to that of the Italian sculpture Gian Lorenzo Bernini, active until 1680. The saint is holding up a martyt’s palm with her right hand and, with the left, is supporting a shield on which the coat of arms of the Grimaldi family is visible. Behind the high altar in the, Chapelle de la Misérricorde (Chapel of Mercy), Monaco old town. 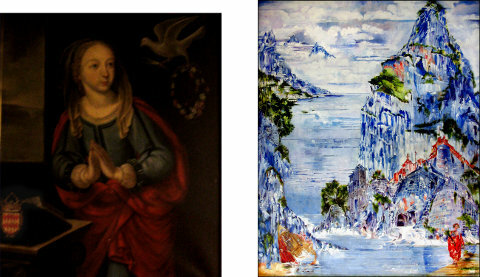 Saint Dévote in a Monegasque Landscape, a painting the author worked on from 2010 to January 2012, is probably the first important painting to be created in the principality of Monaco for more than 350 years where saint Dévote is the principal subject. The canvas shows the saint, the city walls, and the wrecked boat with which her relics reached the principality, set against an immense panorama of the principality. The landscape within which the saint is framed and which shows the city state from different viewpoints builds upon an accumulation of the artist’s decades of paintings and drawings showing Monaco’s natural beauties, all finally rolled up together in one large canvas. The massive rockface, the Tête de Chien, forms a scenic backcloth that overhangs and dominates the fortified medieval walls of the principality; the artist painted other parts of the panorama from the Jardin Exotique. The drawings and watercolours, in sepia, were created from a viewpoint overlooking the Plage des Pecheurs. They are where, in the painting, S. Dévote’s boat is washed up on the coast of Monaco. The vessel is surrounded by fishermen, one of whom is pointing in the direction of the saint, on the right of the composition. She is standing below the city's walls, holding in her arms the palm of a martyr and wearing a crown of red and white carnations, Monaco’s national flower. 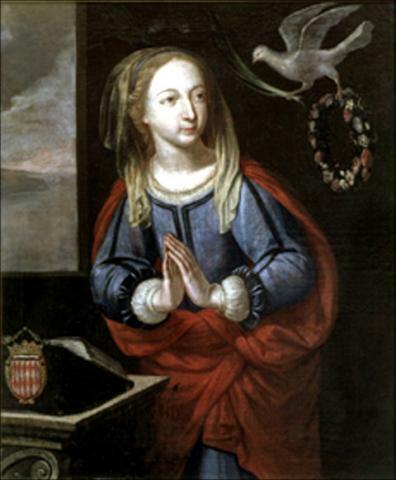 Above her head hovers a white dove that had directed the boat carrying the saints remains to arrive safely on Monaco’s shores. 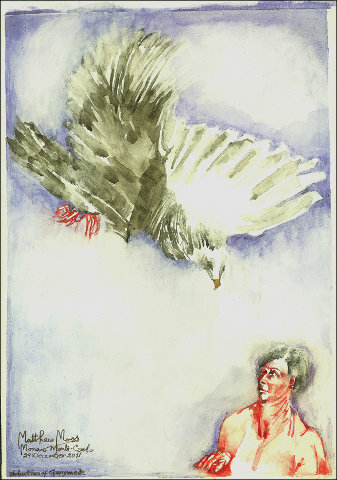 A dove is part of the established iconography that is used in paintings of the saint. Sainte Dévote in a Monegasque Landscape. 180 x 151 cm. Oil and other medium on Irish-linen canvas. In a turbulent sea, with the white foam of the waves beating against the fortified bulwark of Fort Antoine, the red-robed saint holding a martyr’s palm is overlooked by the monumental walls of the old city. Emerging from the rocky promontory is the ochre and red silhouette of ancient Monaco, and, towards the centre background, the Musée Iconographique, nestled into the principality’s rockface and bordered by Mediterranean pine trees and shrubs. The detail above shows the fishing boat that brought Saint Dévote to the shores of Monaco. The artist shows it run aground on the beach. Seaweed-encrusted ropes secure the vessel to the rocky shoreline, its ancient timbers exposed to the elements. The remaining beams are being gradually torn away by the incessant waves beating against the rocks jutting from the Plage des Pêcheurs. In medieval times, but mostly beginning around the 10th. to 12th. century, saints’ relics, for example the Shroud of Turin or Sacra Sindone, of which the first tentative references appear about 1192-1195 in the Pray Codex,  began to acquire great value. In popular beliefs they possessed miraculous and curative powers. Relics were an important economic source for any community lucky enough to possess one of importance, attracting visitors from across Europe and boosting what today one would refer to as the hospitality industry. Hence the seriousness taken in the legend of a failed attempt to steal the saint’s relics, the thief’s flight in a getaway boat and a resulting successful sea chase by a group of fishermen to capture the craft, recover the relics, and burn the thief’s vessel. In 1924 during the reign of Prince Louis II, the same year the Football Club of Monaco was formed, the tradition began of burning a fishing boat in memory of the legendary event. The ceremony occurs annually, on the evening of January 26th. on Place Sainte Dévote, fronting the homonymous church that houses the saint’s relics. In the 16th century Saint Dévote’s relics were required to protect the principality of Monaco itself, against Genovese and Pisan wars of territorial expansion. 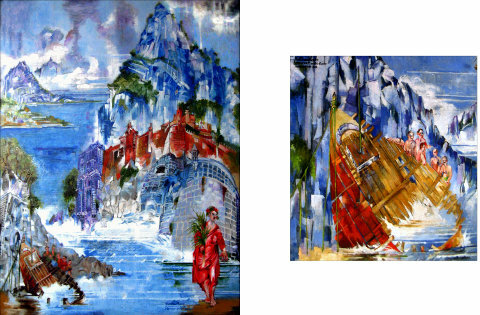 In January 2012, ‘Sainte Dévote in a Monegasque landscape’ has pride of place in the church of Saint Devote when Prince Albert ll of Monaco will preside over the boat burning ceremony. The painting will remain hanging in the church on view to all. 17th. Century French painter reflecting the School of Fontainebleau. Saint Dévote praying in an interior with a view of the sea and sky. The book-stand to the left supports the Grimaldi coat of arms. On the upper right a dove holds a martyr’s palm and a crown of red and white flowers. Roman soldier of the third century from Syria Palæstina, a province formed by merging parts of Syria and Judea 135 to 390 AD under a centralised Roman government. Raphael Sanzio 1483 – 1520 Saint George and the Dragon, c. 1506 oil on panel: 8.5 x 21.5 cm. Andrew W. Mellon Collection of 1937. Washington D.C. National Gallery. Behind the altar in the, Chapelle de la Misérricorde (Chapel of Mercy) in Monaco old town a painting attributed to Jean Baptiste Vento, 1619-1691, ‘The Deliverance of the Souls from Purgatory’ contains the Madonna interceding with God the Father, surrounded by a number of saints amongst whom there is, apparently, Saint Dévote. The canvas is difficult to access and in darkness. This makes it hard to identify the saint. Zolotov, Jouri, Serebrianna, Natalia, et al., Ed. de l’Olympe, 1995, 189 pages, ill. b&w. & colour – French language; description of Poussin’s paintings and drawings in the Hermitage and Puskin mueums. Landscape with Hercules and Cacus, 1658-1659. Oil on canvas. The Pushkin Museum of Fine Art, Moscow -156 x 202 cm. Cacus, a legendary figure of ancient Rome and son of Vulcan, came into conflict with Hercules by stealing some of his prized red cattle that he, Hercules had himself rustled from Geryon, a fearsome giant. Virgil, Eneide Vlll 190-270. Saint Devote. Painting in the chapel containing the relics of the saint in the homonymous church. Copy of original, by an unidentified eighteenth-century painter, in the chapel of the royal palace, Monaco. Right: Preliminary version of St.Dévote in a Monegasque landscape. The artist painted it onto a timber panel lined, front and back, with a cotton gauze, and, similarly, primed with gesso. The style and composition is similar to the finished canvas. The vertical dimensions of the final work means that, in this ‘bozzetto’ (artist’s work study), the figure of saint Devote takes up a proportionally greater space in the composition. Possibly caused by the Napoleonic iconoclasm in the first half of the nineteenth century.